The Hong Kong ICT Awards aims at recognising and promoting outstanding information and communications technology (ICT) inventions and applications, thereby encouraging innovation and excellence among Hong Kong’s ICT talents and enterprises in their constant pursuit for creative and better solutions to meet business and social needs. The Hong Kong ICT Awards was established in 2006 with the collaborative efforts of the industry, academia and the Government. Steered by the Office of the Government Chief Information Officer and organised by 8 Hong Kong ICT industry associations and professional bodies, the Awards aims at building a locally espoused and internationally acclaimed brand of ICT awards. There are eight categories under the Hong Kong ICT Awards 2019. There will be one Grand Award in each category, and an “Award of the Year” will be selected from the eight Grand Awards by the Grand Judging Panel. Mobility and transport are essential if a city is to function properly. There cannot be a smart city without Smart Mobility. A smart city should be connected and citizen-centric, which is accessible to visitors and residents, travelling and moving goods across the city trouble-free, bringing citizens and visitors more convenience, better quality of lives, more sustainable power usage, higher level of safety and city competitiveness. The objective of the programme is to encourage more designs and development of applications leveraging the integration of Internet-of-Things (“IoT”), big data and analytics, as well as mobile applications, which will enhance the flow of people, goods, and tourists; improve citizens' and visitors’ experience; and enable smart mobility for a smarter Hong Kong. The Award programme will serve as a platform to facilitate the community to have a dynamic and transparent exchange of expertise with renowned ICT professionals, to sparkle and co-create innovative ideas, and to nurture technology talents. GS1 HK will also nominate appropriate winners to participate at other regional and global awards competition. We hope that through these recognising and nurturing initiatives, it will further stimulate creativity. Innovation and technology are drivers for economic growth and the key to enhance business competitiveness. Award winning cases attest to successful implementation, helping users in Transport, Logistics and Tourism understand the value of smart business applications, encouraging industry adoption, creating a mutually beneficial interaction between technology and business sectors, which leads to a sustainable eco-system of technology-driven new business paradigm. Transportation is an important pillar for every citizen in a city. Smart technology can be leveraged to improve transportation experience and convenience for user. Connected vehicles, alternate fuel vehicles, autonomous vehicles, car pooling, smart parking, smart traffic devices, upgrading airport into a smart airport through automation, mobility, personalisation and self-service are some of the examples of how smart transportation can create a seamless, passenger-centric travel experience while minimising the impact on environment. The objective of this stream aims at using ICT, making mobility ‘intelligent’, improving traffic monitoring and transportation accessibility and efficiency, cutting down door-to-door journey times, reducing congestion, improving the flow of people, improving safety and liveability, thus, enhancing quality of life for citizens. Smart Logistics is about improving the supply chain, shifting from traditional supply chains to open supply networks, together with integration of new technologies in managing the goods movement, inventory, warehousing, handling, packaging and security of goods between the point of origin and the final recipient, no matter whether the means of transportation is by land, by sea, or multi-modal, so as to achieve end-to-end supply chain efficiency and visibility. 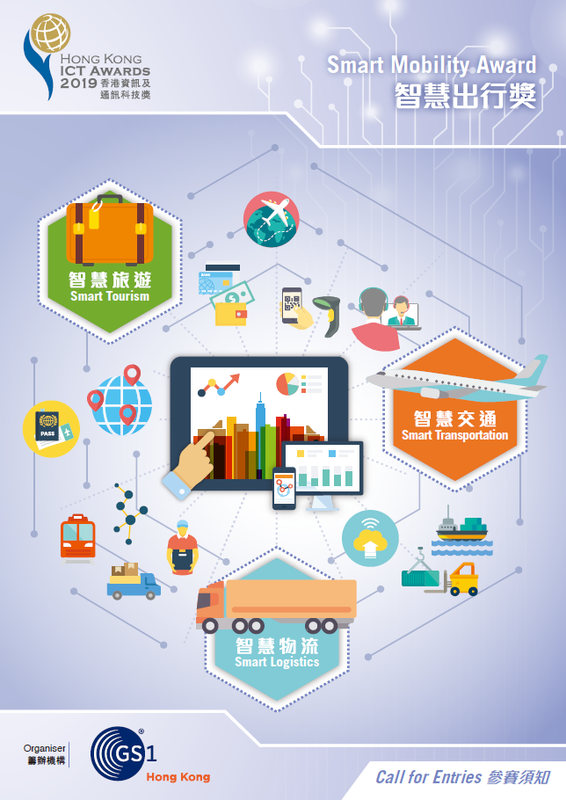 The objective of this stream aims at using technologies innovatively to improve supply chain visibility, streamline and optimise the cargo and baggage handling efficiency and intensity in logistics industry of Hong Kong. Smart technologies are changing consumer experiences and are generating creative tourism business models. Big data, mobile apps, location-based services, geo-tag services, facial recognition, beacon technology, virtual reality, augmented reality, and social networking services are all cutting-edge examples of smart technologies enhancing the tourism experiences and services. Smart tourism allows tourists to better communicate and interact with and in cities to establish closer relationships with not only residents but also local businesses, local government and city attractions. The objective of this stream aims at using technologies innovatively to achieve resource optimisation and convenience for the tourism industry. Also, to enhance travellers' information accessibility, transportation, dining (food and food services), shopping and accommodation experience. Smart tourism allows tourists to better communicate and interact with and in cities to establish closer relationships with not only residents but also local businesses, local government and city attractions. The applicant must have the intellectual property right and/or legitimate right over the ICT product/service mentioned in the application. The applicant shall disclose disputes any place over the world over intellectual property right about the applicant’s ICT product/service, if any, for the Organiser to consider eligibility of the application. The application must be submitted by locally (Hong Kong) registered entities (please enclose Company/Business Registration proof) or residents in Hong Kong *3 at the time of closing for entry enrollment. A significant part of the innovation, design, research and development (R&D) of the mentioned ICT product/service must come from resources in Hong Kong. The applicant should demonstrate significant value-add by the Hong Kong resources contributing to the success of the ICT product/service in the target market. With the exception of the Student Innovation category, the submitted product/service must have been available *4 in the market or in live operation for at least 3 months at the time of closing for entry enrollment (please enclose proof). The same application is only allowed to be submitted to a maximum of ONE award stream among all the Categories. Any application found to have entered into more than one award stream will be disqualified. Winning entries of the Gold/Silver/Bronze award in previous years of the HKICT Awards can enter the Awards again only if there is significant change or enhancement in the product/service, or for a new award category. *3)“Residents in Hong Kong”, in the context of HKICT Awards, include both permanent and non-permanent residents. If an entry is submitted by more than one person, at least half of the members of the group must be Hong Kong resident. *4) Examples are applications and products already in the market, application systems deployed internally in a company, and mobile solutions available at App stores. For startup companies competing for ICT Startup Award, prototypes appear only on kickstarter or similar platforms are NOT considered as available in the market. Applicants are advised to be aware of the best practice and case-based experience as promulgated by the Office of Privacy Commissioner for Personal Data. Applicants are reminded that any person who, without the permission of Steering Committee of Hong Kong ICT Awards, offers an advantage to parties involved in the Awards as a reward or inducement for doing any act or showing favour in relation to the Awards commits an offence of the Prevention of Bribery Ordinance (Cap. 201). To avoid conflicts of interest and the perception as such, applications for the Awards from sponsors will not be accepted. In case of any dispute, the decision of the organiser will be final and binding on all parties concerned. The Judging Panel consists of professionals of the ICT industry, with members coming from relevant industry and professional associations, companies, educational institutes, and government bodies. During the course of evaluation, assessors may require access to relevant information in the entrant’s possession and access to the entrant’s premises. The entrant will be notified in advance if such access is required. Any information supplied by the entrant for the purpose of the HKSAR ICT Awards 2018 - Smart Mobility Award will be treated as confidential, and will not be released by the Organiser and related parties without the entrant’s permission. Airport Authority Hong Kong / Center of Cyber Logistics, AISCL, The Chinese University of Hong Kong / ubiZense Ltd.
Miramar Hotel and Investment Company Ltd. Single Person Transport Design (SPTD) Ltd.
Airport Authority / MTel Ltd. / Cherrypicks Ltd.
Airport Authority / E-Business Solutions Ltd.
Harbour City Estates Ltd./ Compathnion Technology Ltd.
2. Completed form should be returned to the Organiser’s office no later than 12:00 noon on 18 January 2019. 3. Applicants can also submit the entry form via email ictawards@gs1hk.org no later than12:00 noon time on 18 January 2019. There will be a Participants' Briefing short after the closing of the application submission. Areas of attention for applicants will be highlighted in the Briefing. Judges/Assessors and past winner will be invited to share their views and experiences. Smart Mobility (Smart Transport) Certificate of Merit: MTR Corporation Ltd.
Smart Mobility (Smart Transport) Bronze Award: God Taxi App Ltd.
Smart Mobility (Smart Transport) Silver Award: GreenSafety Technology Ltd.
Smart Mobility (Smart Transport) Gold Award: Airport Authority / MTel Ltd. / Cherrypicks Ltd.
Smart Mobility (Smart Tourism) Certificate of Merit: Harbour City Estates Ltd./ Compathnion Technology Ltd.
Smart Mobility (Smart Tourism) Certificate of Merit: Openrice Ltd.
Smart Mobility (Smart Tourism) Bronze Award: MotherApp Ltd.
Smart Mobility (Smart Tourism) Gold Award: Pokeguide Ltd.
Smart Mobility (Smart Tourism) Gold Award: TravelFlan by freeD Group Ltd.
Smart Tourism Gold Award sharing session by Mr. Brian Hui, Co-founder, Pokeguide Ltd.
Smart Tourism Gold Award sharing session by Ms. Joanne Chan, Regional Head of Sales & Partnerships, TravelFlan by freeD Group Ltd.
Smart Mobility (Smart Logistics) Bronze Award: HK Pick-up Ltd.
Smart Mobility (Smart Logistics) Silver Award: Airport Authority / E-Business Solutions Ltd.
Smart Mobility Grand Award and Smart Mobility (Smart Logistics) Gold Award: BPS GLOBAL HOLDINGS LTD.
Ms. Anna Lin, JP, CEO of GS1, with Smart Mobility Grand Award winner, BPS GLOBAL HOLDINGS LTD.